Whaling ships, which visited the Marianas with much frequency in the 1800s, were notorious for grabbing and disposing crew members left and right. At times it was difficult to recruit whalers, so many a captain resorted to questionable methods to put men (and sometimes women) on their ships. It was not unheard of to lure men onto the ship for a party, get them drunk then pull out to sea while they were inebriated. When the poor lad woke up, he was many miles from home. Sometimes, when a crew member or members became problems, such as with illness, or if they were trouble-makers, these whalers were conveniently "forgotten" on shore when the ship ventured off again. It is a credit to the Hawaiian Government at the time that they pursued, perhaps at the urging of relatives, information about Hawaiians who left on a whaling ship and were not heard from again. The Hawaiian Government wrote letters to Manila inquiring about four such Hawaiians reported to be on Guam. The Governor of the Marianas, Pablo Pérez, made the reply to the Hawaiian Government in 1849. Pérez informed the Hawaiian Government that two Hawaiians, a brother and a sister, named John Tahuane and Maria (maybe Mary?) 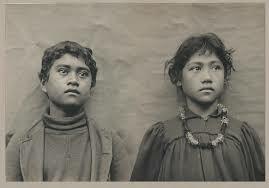 Tahuane were, in fact, left behind on Guam by a French whaling captain named Debats of the ship Gustave. But, Pérez said, he had put the pair on an American whaling ship, the Howard, in January of 1849, and had a signed, written promise by the captain, Alexander Bunker, that he would repatriate the siblings back to Hawaii. In addition, Pérez said there was another Hawaiian, named Kalehuahi, who was abandoned on Guam due to illness by his captain, named Coteel, of the American whaling ship the Alabama. But Kalehuahi died on his illness on May 14 and was, we can assume, buried on Guam. Besides these three individuals, there were no other Hawaiians on Guam to the best of Pérez's knowledge as of that date. Two other Hawaiians the Government inquired about were unknown to anyone on Guam. Because trans Pacific sailing, especially due to the whaling ships, was frequent in the 1800s, our Chamorro ancestors were acquainted with indigenous Hawaiians, and adopted the sometimes offensive term kanaka to describe them. Håfa Adai todos! The Capuchins have been on Guam since 1901. When there were few or no local priests, the Capuchins came to build up the Church - the people, and their churches and schools. Now we have built a new friary and it's you - the people - who have made it possible through your generosity. We humbly depend on that continued support to keep the friary going. If your mother, wife/husband and child were capsized on the high seas, and you could rescue only one of them, who would you save?